Nine month old Levon Wameling has been missing since May 29, 2013 in Utica, New York. The mother of the missing 9-month-old made a plea to the public Thursday to help find her child. 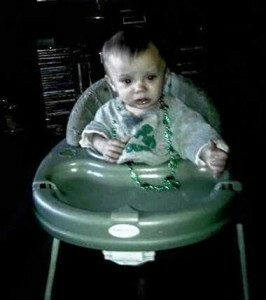 The police stated, the infant was last seen around 11:30 p.m. May 29, on the front porch of 748 Jay Street in Utica. However, according to police Levon’s father, Jevon Wameling, reported the child was missing two weeks after he disappeared when family members were asking about the child. Huh? This is hardly a good sign that two weeks went by before anyone thought to report a child missing. The mother, Amy Warney, was in a rehabilitation facility when Levon Wameling went missing two weeks ago. Jevon Wameling told police he left his child unattended for a few minutes in front of his home on Jay Street when he realized he was locked out of his home. He went around to the back of the home to get inside and when he returned to the front of the house, the child was missing, he said. Officials continue to search the area around Jay Street. Canine units, state police, the FBI, and the Center for Missing and Exploited Children are all assisting with the search. Police have been searching the area for two days. They are interviewing family members and neighbors, they said. UPDATE I: “Based on the information that he’s given us, we have a lot of concern,” said Utica Police Chief Mark Williams. He wouldn’t elaborate on why the father waited until his parents prompted him to report Levon missing. The father told investigators he took the child out for a late-night walk and locked himself out, so he put the boy down on the small front porch to the home and went around back to find a way in. When he opened the front door, he said, the baby was gone. If anyone has any information about the child’s whereabouts to contact the Utica Police Department at 223-3503.